Home Posts tagged "world in vending machines"
A new tumblr about vending machines from all over the world can be found at world-vending-machines.tumblr.com. A scaled copy of the new tumblr blog is shown on fbk-photography.com/tumblr-world-vending-machines. All shown images are captured by myself, unless otherwise stated. 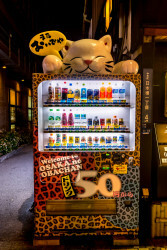 If you see an interesting vending machine anywhere in the world, you can submit a picture via the submit form. Thanks! Impressum | Data protection information.